Judges dive in at the Gladly We Give Chili Cook-off and Baker’s Challenge in February 2013. 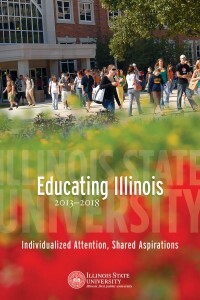 There is no doubt that the investments individuals make in the University’s people and programs are crucial to Illinois State fulfilling its mission of teaching and learning. In fact, if ISU depended solely on tuition revenue, the academic year would have to end in January. Such statistics make clear the importance and impact of private giving. They are being shared across the campus in an effort to build a culture of philanthropy, which is one of the priorities established in Educating Illinois. “We need to begin to educate our students about the importance of philanthropy and that their tie to the institution is a lifelong relationship,” said Lora Wey, executive director of the Annual Fund. She is partnering with Beth Snyder, assistant director of the Annual Fund, to build a legacy of campus involvement and financial support. Educating Illinois in action: Read more about how Illinois State’s strategic plan is being implemented: EducatingIllinois.IllinoisState.edu. Annual Fund programs create opportunities for faculty, staff and students to support Illinois State’s mission. Gladly We Give is one notable example of how the campus community is encouraged to give back to the University. Another equally important outreach effort is to students, who are especially important to creating a solid foundation of private support well into the future. More is being done to make them aware of ways they can support the University before they graduate. Wey and Snyder run the Senior Campaign, which encourages graduating students to give the equivalent of the year they finish their degree. Ten percent of the 2013 class gave $20.13 to the University program or unit that impacted them as a student. In return, they received a unique tassel to wear at commencement. The student giving program dates back to 2007, when it was introduced as Spirit Tassel. Wey and Snyder changed the name this past year, and simultaneously shifted the emphasis from having students purchase a tassel to helping them see the opportunity to make a difference at the University. She and Wey are confident students are not adverse to supporting Illinois State, just unaware of the need and the fact that a gift of any amount is significant. They are focused on helping students find their passion and invest in it, which means gifts are designated to everything from an internship program to an Athletics team or Registered Student Organization. Student response is strong and will only increase as more is done to create a culture of giving. Wey and Snyder are laying the groundwork for a four-year program that integrates giving messages and opportunities throughout a student’s time on campus. During the past year, for example, an email campaign was launched, banners and elevator clings placed across campus, and mailings done to share facts about limited state funding and the power of a private gift. Other ideas under consideration include a philanthropy week, during which Registered Student Organizations would focus on some kind of initiative that gives back to the University. Having a team of students willing and able to share with their peers the benefits of becoming involved while still enrolled is another possibility. “It’s not that our students are unwilling to invest, it’s that they just don’t know the needs and opportunities,” Wey said. She emphasized the lack of awareness in general within the campus community, which is why the goal of building a culture of philanthropy is such an important part of Educating Illinois. “We have to educate the entire community, not just the students,” Wey said, adding that she sees great potential for such a culture to expand and thrive because of the Redbird pride that is growing within all campus constituencies.